I am so excited to share this fabulous t’shirt with you! Seriously, is this not the cutest shirt?! Here’s my little Everet sporting this wonderfully handmade/handprinted “i roll with Jesus” tractor shirt. The t’shirt is 100% cotton and of very high quality….thick, soft and durable. (baby)FishStix is a sweet online store owned by Megan who is a wife, and mom of 3 young children (Micah-4, Eli-2, Elizabeth-7mo). Megan grew up most of her life in Iowa except for 4 years on Kauai where her first son was born. She makes items that she would like her own children to wear (and they do!). Her items are individually hand dyed, vintage style, with water based ink. She also makes other handmade items (onesies, t’shirts & tutus) and welcomes custom orders. Click HERE to be directed to her shop or visit her blog. If you mention ‘Stayfunnie Mom’ when ordering in June or July, you will get free shipping on anything! 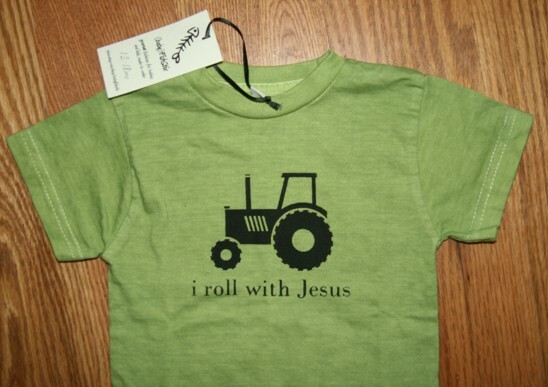 (baby)FishStix is giving away one “i roll with Jesus” t’shirt (your choice of size, shirt/ink color) to one of my readers. To be entered twice, leave me a comment below. The Giveaway will end this Friday, June 18 at 3:00p.m. 2 comments to (baby)FishStix Product Review & Giveaway!